Poong-chun, Deok-ki, and their lady comrade-in-arms Seol-rung were once dreaded warriors leading a rebellion against Goryeo Era tyranny. Unfortunately, betrayal cut short their uprising, along with the principled Poong-chun’s life. However, it was not jealousy that tore the trio asunder. It was more of a case of miscommunication. 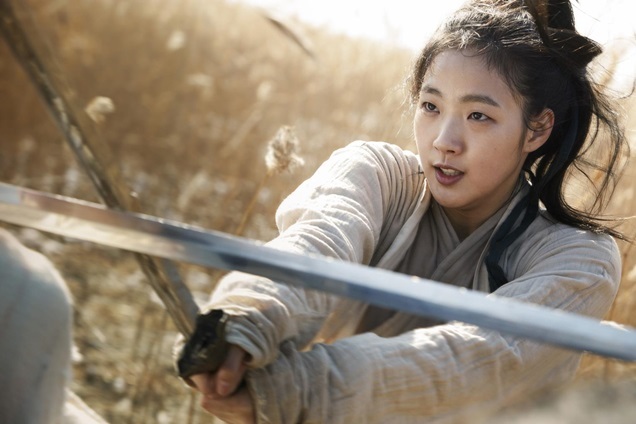 Of course, the tragedy compounds mightily when Poong-chun’s daughter seeks to avenge her murdered parents in Park Heung-sik’s Memories of the Sword (trailer here), which opens this Friday in New York. For years, Seol-hee has been rigorously trained by Wol-so, a blind tea house proprietor to wreak vengeance on her enemies. Wol-so has kept many secrets, including her real identity: Seol-rung. She is not the only one living under a new name. Deok-ki is now Yoo-baek, a general so competent, he is naturally despised by his colleagues in court. The feeling is mutual. When Yoo-baek observes the masked Seol-hee crash his martial arts contest, he immediately recognizes Seol-rung’s style. When news of her escapade reaches Seol-rung, it forces her hand. Revealing herself and Yoo-baek as Seol-hee’s familial enemies, Seol-rung casts out the girl with only her father’s sword. It is sort of a case of tough love, but it confuses Seol-hee no end. Nevertheless, it is suddenly healthy for her to be far away from Seol-rung. At a youthful twenty-four (looking more like twelve), Kim Go-eun (who exploded onto the scene a mere three years ago in Eungyo (a Muse)) notches her first action lead here as Seol-hee. In fact, she is rather perfect for the role, looking young and vulnerable, but flashing some convincing moves. Yet, Jeon De-yeon truly delivers the romantic angst and a fair number of beatdowns as the very complicated Seol-rung. In contrast, international superstar Lee Byung-hun seems to be somewhat distracted as Deok-ki/Yoo-baek, as if he were waiting for his next G.I. Joe script to arrive, but Lee Kyoung-young makes an unusually hardnosed Yoda as the trio’s powerful and reclusive teacher. There are some spectacular martial arts sequences in Memories, as well as some Crouching Tiger-esque scenes of skipping across rooftops and treetops that defy logic and gravity, but still look quite cinematic. Indeed, Park elevates the film with a good deal of visual poetry. Genre fans will also appreciate how he steadily deepens the impassioned tragedy with each new revelation. Recommended for action fans who appreciate classy production values and a bittersweet payoff, Memories of the Sword opens this Friday (8/28) in New York, at the AMC Empire.